GENEVA, Switzerland (KTRK) -- The International Organization for Migration says at least 1,000 people have died or are missing and presumed dead following a string of deadly incidents in the Mediterranean Sea over the last week. The updated IOM tally on Tuesday was drawn from accounts from survivors who were saved at sea or landed in Italy in recent days. Figures from aid groups and Italian police had on Sunday counted at least 700 deaths from three shipwrecks over three straight days, but IOM pointed to other smaller incidents as well as more precise figures following interviews with survivors. 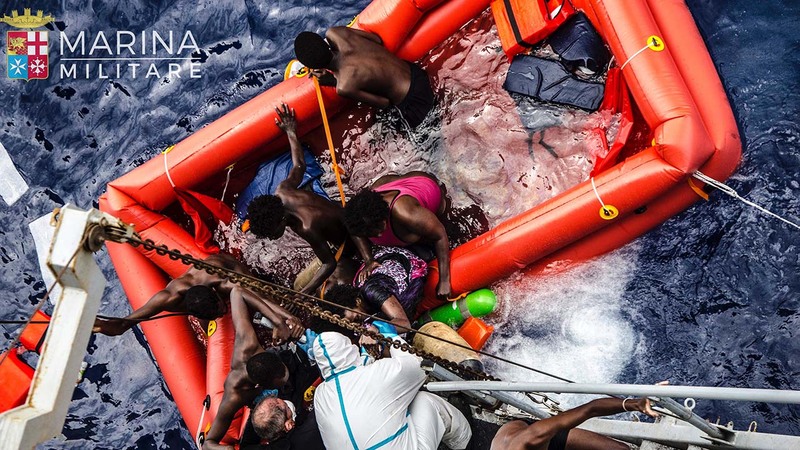 The IOM says 62 people were confirmed dead and another 971 were missing and presumed dead in nine incidents on the central Mediterranean route between Libya and Italy since May 25. Czech police say they have broken up an international criminal network that was producing and distributing forged Lithuanian documents for migrants in European Union countries. Police spokesman Pavel Hantak says 10 suspects from former Soviet republics were arrested across the Czech Republic. Five of them were from Ukraine but he didn't specify the nationality of the others. In a statement on Tuesday, Hantak said the forged documents - passports, IDs and driving licenses - were transported by the group from Lithuania, where they were produced, to the Czech Republic and other EU countries. Hantak didn't given details about the migrants, saying only that they didn't qualify to stay in the EU. He says seven migrants using such forged documents were arrested in the Czech Republic. Prosecutors in Sicily have announced the arrests of 16 suspected smugglers who were aboard a boat carrying nearly 900 migrants that was rescued without incident over the weekend. Authorities said Tuesday migrants identified the suspects during more than 24-hours of questioning. One was identified as the navigator and the others as aides who helped keep order and fuel the engine. Prosecutor Michelangelo Patane said passengers also recounted that only the smugglers were given life jackets, and that they paid between 500 and 1000 euros ($556 and $1,112) to take the risky voyage. Many said they were previously held for four to six weeks in houses in Libya and were fed only once a day. Police in northern Greece say a Pakistani man is being treated in hospital after being shot at a makeshift camp for migrants and refugees near the border with Macedonia. The 19-year-old man, whose injury was described as not life-threatening, was hospitalized early Tuesday and told police he had been attacked by another Pakistani migrant who hasn't been identified, authorities said. About 300 people are staying at the makeshift camp that sprung up near the border last week after the government cleared a huge settlement in the area. Also Tuesday, four Syrian men were hospitalized with minor injuries after a fight broke out at a government shelter for migrants in northern Greece. More than 50,000 migrants and refugees remain stranded in Greece following European border closures earlier this year. Police in the southwest German city of Darmstadt say they are investigating allegations that young women were groped during a weekend music festival and have arrested three asylum-seekers from Pakistan. The allegations from 18 women that they were surrounded by groups of men and groped are reminiscent of similar attacks on a much greater scale in Cologne on New Year's Eve, which were blamed largely on foreigners. Those attacks prompted the government to tighten laws governing foreigners committing crimes. Darmstadt police told the dpa news agency Tuesday that they had arrested three Pakistani asylum-seekers, ranging in age from 28 to 31, and were searching for two to three more believed to have been involved in the Saturday night incidents. Some 400,000 people attended the four-day open-air music festival. The U.N. refugee agency says survivors' accounts indicate that shipwrecks and capsized boats have claimed at least 880 lives over the last week in the Mediterranean.